Bislama is the National Language of Vanuatu, an island nation located in the South Pacific, 1750 km north east of Australia. Bislama is based on English with 95% of the words having English origins and the remainder being French and local words. English and French are also widely spoken in Vanuatu and together with Bislama are the "official" languages. Bislama was developed during the 1870's and 1880's in the 'Blackbirding' era when thousands of Ni-Vanuatu were forced to work on plantations in Australia and Fiji. Coming from many different islands that each had their own local languages, a form of pidgin English was developed that combined English words with the grammatical structures from the Pacific region. This pidgin allowed communication between the native populations and also with plantation owners, European traders and settlers. When the survivors of the Blackbirding returned to their islands in the early 20th century, this pidgin became widespread and is the origin of the widely spoken Bislama in Vanuatu, Tok Pisin of Papua New Guinea and Pijin of the Solomon Islands. Today, Bislama is the common language that is used between Ni-Vanuatu people that come from the 83 islands of Vanautu and who together speak 113 languages. 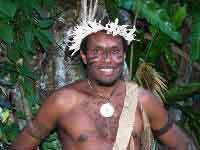 With a small population of only 252,000 people, this makes Vanuatu the most language-dense country in the world. Language is very important to the people of Vanuatu, explained very well by Mr Odo Tevi, Ambassador and Permanent Representative of Vanuatu to the United Nations in his speech on International Mother Language Day, 21st February 2017. Read his speech here.